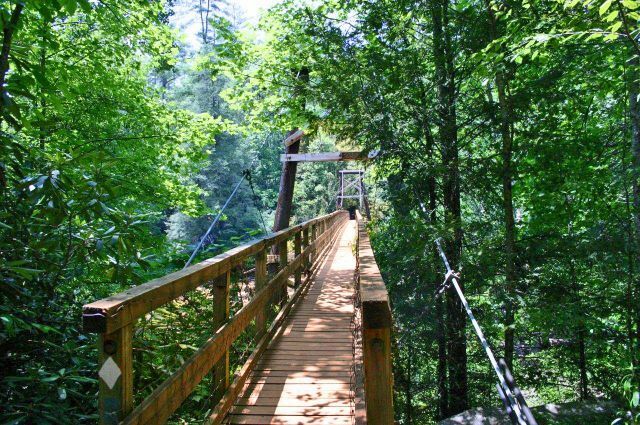 Take the family on a short relaxing hike to the legendary Toccoa River Swinging Bridge. There is ample room by the river for the kids to play in the water and to enjoy a peaceful picnic by the rapids! The Swinging Bridge is a 270-foot suspension bridge located over the Toccoa River and can be reached by the Benton MacKaye Trail and the Duncan Ridge National Recreational Trail in Fannin County. HELPFUL TIPS FROM LOCALS: There are two ways to access this trail. The most popular requires you to travel on forest service road for 4 miles and park in a designated parking area. If you begin here, the trail is 1 mile round trip. If you would prefer a longer hike, you can park at the bottom of the forest service road and begin your ascent here. If you start your hike here, the trail is 9 miles round trip.